Weary souls stare out through anguished eyes from the confines of a barren steel cage. Dressed up in a human coat and pair of pants, a young macaque alarm calls while forced to hop around painfully and abnormally in the snow as people laugh and exclaim, "How cute." A lone male baboon paces and spins relentlessly across dirty, worn concrete with no end in sight to his impossibly sterile and diminished life. These are just a few of the images that trouble me to my core and I often wonder how we, as a species, can possibly survive our own cruelty. The injustices we heap upon ourselves, and other living beings with whom we share the planet, seem beyond comprehension at times. One of our greatest attributes is our ability to empathize - to put ourselves in someone else's position and seek to understand. And, in doing so, we gain both wisdom and compassion. But, too often, empathy is viewed as a weakness and compassion deemed unrealistic and sentimental, especially when applied to nonhuman animals. In the wake of "practicality" floats the misery of literally millions of beings. Each and every day seems to bring me face to face with yet another atrocity perpetrated on an innocent life and I'm sure you can understand how easy it would be to become discouraged and to question if we've progressed as a species at all. Fortunately, each and every day also brings me face to face with just how much difference a simple act of kindness can make in a once-tortured life. When I look into Poco's eyes, I now see an interested, engaged, and wholly alive being. 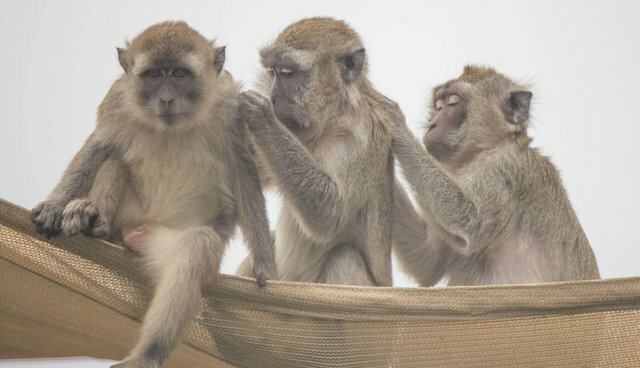 From a life of boredom and rage in a small cage to a large outdoor enclosure replete with grass, sun, sky, and, best of all, other monkeys, this has been a healing journey for her. And, it has been instructional and inspirational for all of us, too, in ways we may never fully realize. Chongo, Mississippi Mac, Tweak, Tamae, Freeman, Sissy, Sassy, Alice, Mongo, Gilbert, Justin, Amiya, India, Zach, and so many more all have a more fulfilling life now. And, they have that new life because somewhere, at some time, someone was brave enough to care. They have quality food, large spaces, and ample opportunities for socialization. They spend their lives in a natural environment with birdsong echoing through the mornings and crickets singing them to sleep. And, they have these things because many someones continue to care. They are the faces of our better selves reflected back to us - our finest qualities evidenced in their enriched lives. As winter turns to spring and life blossoms from stillness, I'm grateful to everyone who has supported the wonderful lives for which we care. You are the someone who gives us all a reason to believe.